I’ve had a crazy sweet tooth this pregnancy. Like, I need a dessert after every meal/snack I have. I think its natural that I crave sweet breakfast items like pancakes, waffles, and french toast. All three of those breakfast items are topped with sweet maple syrup. Sure, I’ll have my greek yogurt, fruit, and granola parfait at like 6am on the weekend and then by 8am I’m ready for “breakfast” or sometimes I’m ready for dessert, and that’s when I make a recipe like this one, Chocolate – Chocolate Chip Buttermilk Pancakes. My husband isn’t really into the dessert like breakfast items, but has grown accustom to them over the past 8 months (yes, I know–I can’t believe I’m 8.5 months pregnant–it’s mind blowing). He doesn’t really complain. I remind him to be grateful that he is getting a hot breakfast. Plenty of starving husbands out in the world that get to enjoy cold soggy cereal, and he gets a hot breakfast just about every Saturday and Sunday! I really wanted these to be red velvet chocolate chip buttermilk pancakes, but I ran out of red food coloring. They didn’t really turn out “red velvet” like…. so that’s why I’ve called them Chocolate – Chocolate Chip Buttermilk Pancakes. I used mini chocolate chips, since my husband isn’t really a fan of chocolate to begin with (but let’s get real, who did I make these for? me!). 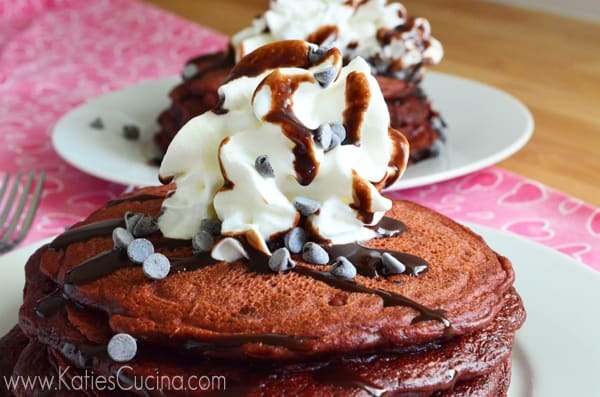 The mini chocolate chips just make the pancakes that much more decadent. For my husbands version, I topped his with fresh strawberries and whipped cream, and my version is the one pictured and written about with more chocolate chips and chocolate syrup. I think I disgusted my husband when he saw what I did to my pancakes… but he said nothing and kept eating his pancakes like a good husband would do! 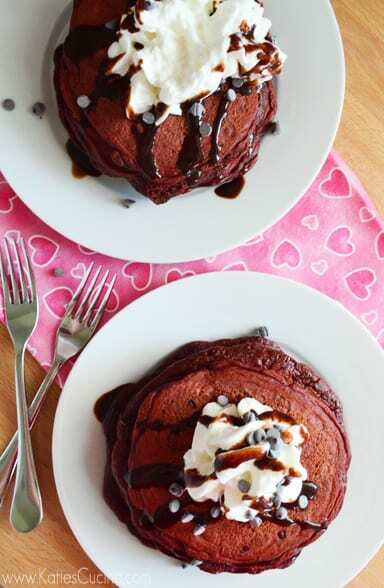 If you’ve opted to celebrate Valentine’s day over the weekend and you have a chocolate connoisseur you want to swoon… make these Chocolate – Chocolate Chip Buttermilk Pancakes. In a large bowl, combine flour, sugar, baking powder, baking soda, salt, and cocoa powder. In a separate bowl, beat together buttermilk, milk, eggs, and melted butter. Add a few tablespoons of butter to a frying pan or griddle over medium-high heat. Pour the wet mixture into the dry mixture, and blend well, then add the chocolate chips. Stir until it’s just blended together. Make sure to not over stir! Using a soup ladle, pour the batter onto the griddle, using about 1/2 cup for each pancake (or less if you want silver dollar pancakes). Cook for 3-5 minutes or until bubbles start to appear on top. Then flip and cook for one additional minute. Top with whipped cream, mini chocolate chips, and drizzle with chocolate syrup. For a deep chocolate color add 20 drops of red food coloring to the batter. For "red velvet" version add 2 tablespoons! I can’t believe you are 8 1/2 months pregnant!!! I’m ready for the bambino to arrive. Ummm yeah it’s crazy talk. I can’t believe it either… like 40 some days until my due-date! yikes!!! LOL I agree–who needs fruit when you can have chocolate? lol. These pancakes are the answer to my kids’ prayers!! They would love these! I can not wait to meet your little one! LOL I’m sure any kid would love these pancakes! 🙂 I can’t wait for our boys to meet each other!!! chocolate is amazing at all times of the day! love these pancakes!! Ha ha glad you think like I do, Kayle! My kiddos would love these pancakes! I would have pancakes for breakfast, lunch or dinner! These look so yummy. I might have to make these this weekend. Because I can’t stop staring at these pictures now. ha ha thanks Steph! Hope you get to make them! Dear sweet mother of it all, those look fabulous! Thanks Meredith! These pictures do not do them justice! Suddenly my cappuccino isn’t tasting so good. Want. Now. LOL… I think it would pair nicely with a cappuccino! I’d rather have chocolate chocolate chip than red velvet anyway! GORGEOUS! 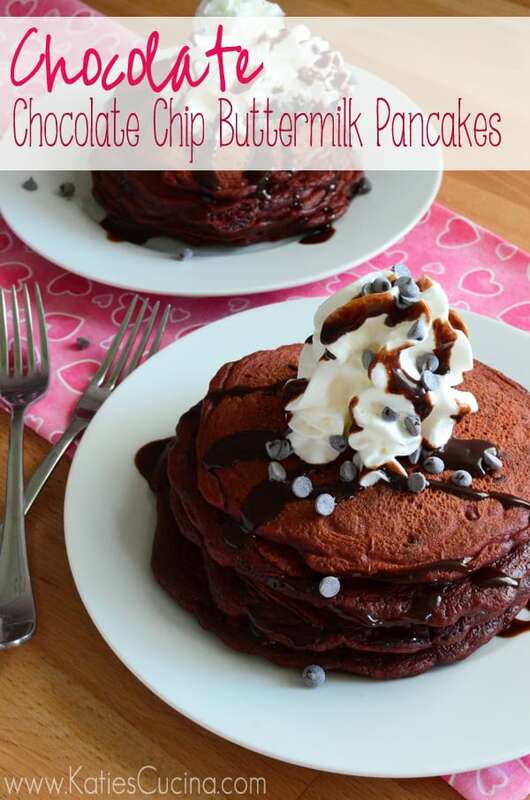 Can never have enough chocolate, can never have enough pancakes! Be still my heart, those look divine..